What it’s about: Imagine for a moment that bioengineering and robotics had been invented in the early 1900s and taken off at an astonishing rate. The British latched onto Darwin’s findings and before you could say “Dr. Doolittle” they were splicing genes together to create fabricated beasts for labor and war. A whole class of animals has been bred to breathe hydrogen and now creatures of the sea have taken to the sky as giant breathing airships. Meanwhile, the Germans have developed colossal walking machines piloted by men, from two-man walkers the size of a tank to giant roving battle-stations stomping about on eight legs. Scott Westerfeld takes us into this world through two points of view: Deryn, a gifted young airwoman who has lied her way into a post as a midshipmen in the British Air Service on the whale fabricant Leviathan; and Alexsander, the son of an Austro-Hungarian archduke whose wife’s less-than-royal blood has kept Alexsander from being next in line for the throne. Westerfeld creates a clever bridge between actual European history and the events of his alternative timeline. The novel opens just after the now infamous assassination of Alexsander’s father the archduke, which sparks World War I (though Franz Ferdinand did have children, none were truly named Alexsander). From there we see the battle lines drawn out in much the same way as they really progressed, but this time the conflict is at heart an ideological one between “Darwinists” (nature and science) and “Clankers” (mechanics and religion). Alexsander is forced to flee with a few members of his household as he is hunted by Austrians and Germans who fear his claim to the throne. A stroke of luck sends Deryn on her first mission, as part of an airship crew escorting a female doctor to the Ottoman Empire with precious but secret cargo. I’ve been meaning to read this book ever since I edited The Steampunk Bible. Though Leviathan is YA, it’s certainly something an adult could enjoy. Part of the fun of it is the giant thought experiment that’s occuring and the intriguing mash-up between history and fiction. The Steampunk element comes in through the futuristic revisions—living airships vs robots—but at heart it’s an amazing adventure story. Deryn and Alexsander are compelling POV characters, one a sheltered aristocrat forced out of his family home and into a world as a fugitive, and the other a common girl trying to gain respect in a man’s world. Though they come from different classes, they have more in common than they might guess. Both are hiding their true identities and want to achieve great things but have many hurdles to overcome. As an added treat there are illustrations sprinkled throughout. 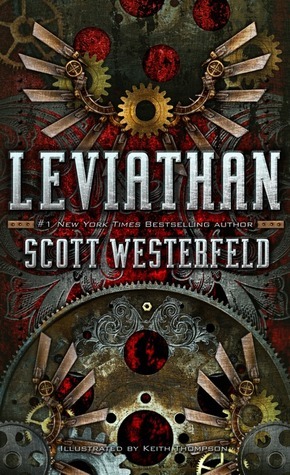 While working on Steampunk Bible, I learned that Westerfeld and his illustrator Keith Thompson worked together in a very novel and symbiotic way. Sometimes Westerfeld would describe the scene he wanted illustrated, but Thompson would also produce sketches that would then inspire Westerfeld’s prose. The black-and-white line drawings are striking and add to the historical feeling of the work and the authenticity of the beasts. Since the things Westerfeld describes seem so fantastical and strange at times, they are grounded and made more real by these images. Would I recommend? Sure! If you enjoyed the His Dark Materials trilogy, I think you’ll love this world as well. I got wrapped up in Westerfeld’s adventure story and can’t wait to come back for part 2.